I have a great affection for Diderot and see him embodying most of the Enlightenment’s virtues (tolerance, curiosity, skepticism, logical thought, creative intuition) and few of its vices (overreaching, overgeneralization, arrogance, optimism, cynicism). This little portrait of him by the French Radical-Socialist Prime Minister Edouard Herriot (a flawed but still sympathetic figure in his own right), written in 1953, captures a great deal of his charm, though I think it’s on display in nearly everything he wrote. I remember how in 1913 the French Senate wished to celebrate the second centenary of Diderot’s birth. I was then a member, the youngest, of that assembly. I said a few words which met with very little response. The Chamber did not support the suggestion that his remains should be moved to the Panthéon, and Maurice Barrès expressed his satisfaction at this in a careful essay which appeared in his book Les Maîtres. 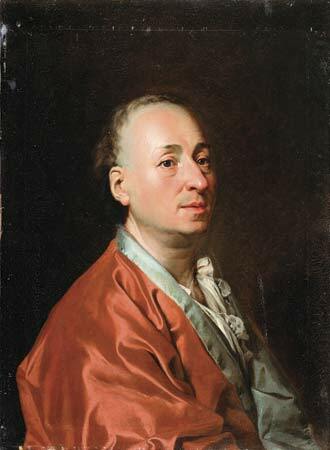 He did not consider Diderot to be a national figure; he saw him merely as a remarkable revolutionary genius, able as no one else to place charges of dynamite under all the principles and pillars on which society rests; a professor, as it were, of anarchy and an enemy of tradition. As a matter of fact he wanted to study everything and to know everything. As soon as he left college his true nature became apparent. Unable to settle down in an attorney’s office, refusing to choose a definite profession, flitting from literature to science and from Italian to English, mixing with company of every description both good and bad, but more often the latter, composing sermons, if necessary, for a Portuguese missionary, tutoring the children of Randon d’Haunecourt, the financier, but throwing up his job in order to be free again, sometimes reduced even to hunger, he managed to gain through his very independence a wide experience and culture which made him a singularly intelligent and well-informed Bohemian. At one moment we see him dressed in a grey plush coat taking a summer stroll along the Allée des Soupirs in the Luxembourg Gardens, and, at the next, wandering through the streets of Paris with torn cuffs and black woollen stockings sewn together at the back with white thread. His originality lies primarily in his vast culture and in his scientific knowledge, so far in advance of that of his contemporaries. He had already reached an idea of transformism, the doctrine of evolution. A materialist, in favour of morality for sentimental and practical reasons, not from philosophic conviction, laudably hard-working, curious about everything, often confused, even incoherent but generous, cordial, with a shade of coarseness, becoming intoxicated with ideas, as others do with wine, vulgar at times and disordered as he was said to be, outstanding quality was life.